I'm much more comfortable in my relationship with a great song when I appreciate that artist's work in general. It's confusing to come across a great song, but not really click with much of the rest of the artist's material. 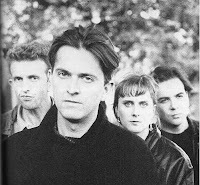 I have yet to click with Prefab Sprout, and I don't know why. I definitely respect them, and their music is occasionally quite lovely, but somehow I haven't made it into fan territory. I'll keep trying, though, because 'The golden calf' is a great song, so I suspect that the deficiency is mine, not Prefab Sprout's. Frontman Paddy McAloon is known to have a penchant for Americana. He writes about Steve McQueen, Jesse James and Elvis. He's influenced by Steely Dan, Beach Boys and Bruce Springsteen. 'The golden calf' sounds to me like 'Dancing in the dark' if it had been written by a European; it bursts with the same vitality, and rocks with the same combination of ingenuousness and enthusiasm. But it shows an urbanity and literacy that are in a different realm from Springsteen's everyman aesthetic. As an arrangement, nothing could be more straightforward. A basic rock outfit takes on an uncomplicated, aggressive song where choruses follow verses, there's a well placed bridge to catch one's breath, and everything goes off without a hitch. It's a case study in danceable rock capable of rousing a stadium. And one is completely free to enjoy 'The golden calf' purely on that level; beyond an equally exemplary melody, the words aren't at the forefront of the song, and at times they're difficult to decipher without assistance. But if you take the time, a whole other dimension of the song opens up. A word or two? Is that modesty or sarcasm? This is the first verse and it could be the start of an epic, or at least a gothic novel. Who is this guy, and what adventure is he beginning? He sings in part to a woman whom he loves with a kind of chivalry, viewing her as above his station and unattainable, but finding inspiration in his unrequited passion. This guy really deserves a shot with her, though, based on his poetic gifts alone. Could you easily refuse someone who praised your 'windswept harbour love'? Our hero goes back and forth between decrying the injustice his lady has suffered ('Your dashing horsemen have gone away / Left you the stable bill to pay / And now the golden calf has turned to clay') and rushing headlong on his journey to maturity and self-knowledge ('I'd resort to sleepwalking / to catch the mood that fills the sails... and how capricious nature ruled my mind'.) It becomes clear that he is not going to win or lose the object of his devotion; while she may be the premise, in this song she is not actually the point. We don't find out in this song; he pitches back into the same chorus, another pledge of solidarity to his lady. The song actually seems to build momentum, hurtling into the fadeout. It's an amazing snapshot of the tumultuous adventure of youth, when everything is vital and universal, and whatever happens next is mysterious and potent. The religious shading in the song is interesting because the rest of the song is pointedly secular. Along with the chivalric element, to modern ears it gives the song a classic tone, as if Rousseau were the reference point, rather than JD Salinger. At its heart, though, 'The golden calf' is the kind of infectious rock song that its performers seem to enjoy playing so much that they repeat the first verse and chorus with only one line altered, primarily to prolong the pleasure. What a bonus to meet a fascinating hero while along for the ride.